The Emergency Action Plan sets out the responsibilities of all organisations associated with assessing potential emergency situations or unusual occurrences and implementing preventative actions. The responsibilities and actions of each organisation are outlined in the Company’s Emergency Action Plan. As the Dam owner, Opuha Water is responsible for the dam, but has contracted the operations activities for the dam to Trustpower Limited. Each organisation involved in the Opuha Dam emergency planning will have their own internal policies and procedures. These will determine their actions in the event of an emergency. The intent of the emergency action plan is to outline the actions to be taken by Trustpower Limited acting on behalf of Opuha Water, when dealing with emergency situations and/or unusual occurrences at the dam site. Preliminary warnings to Civil Defence Emergency Management and NZ Police will be utilised wherever possible. The priority of the plan is that, in any emergency situation where a condition of a serious nature has developed that may endanger the integrity of the dam and/or downstream property or life, Opuha Water or its agent must immediately notify the New Zealand Police, Civil Defence Emergency Management at Timaru and Mackenzie and ECan (Natural Hazards). Downstream residents/landowners that may be affected by the emergency situation must also receive early warning of an emergency situation. These notifications can be initiated by calling Timaru Answering Service Ltd (“TAS”) who are contracted to carry out the notifications. Opuha Water maintains a current list of downstream residents and landowners. This list is also held by TAS who carry out regular checks by calling the residents. 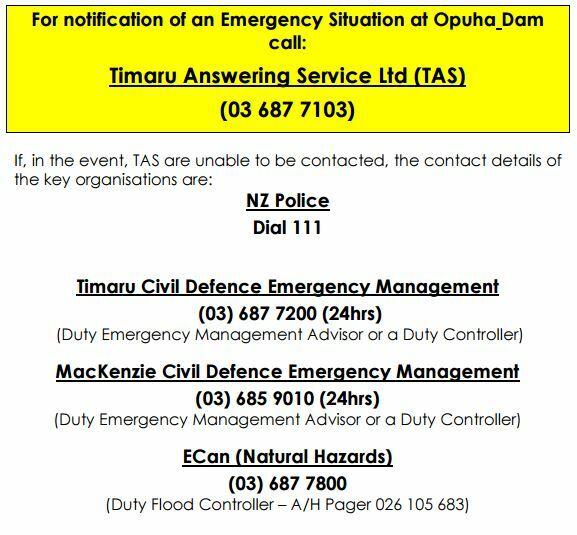 In the event of an emergency, TAS have a prioritised order for contacting the downstream residents to advise them of the situation at the dam and the recommended response. For further information regarding the Emergency Action Plan please contact Tony McCormick, Chief Executive Officer.